The Shanghai Soong Ching Ling Foundation and Eaton China launched a charity fund today to support social causes in China. 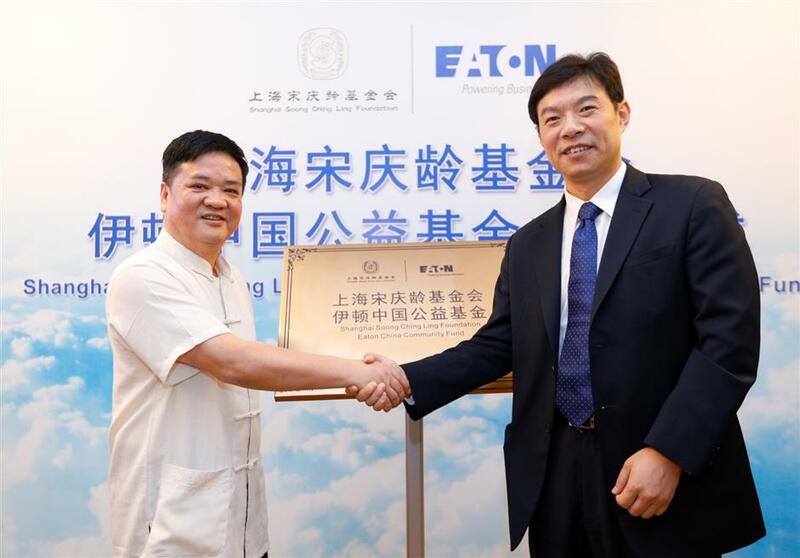 Jia Yong (left), deputy secretary-general of the Shanghai Soong Ching Ling Foundation, and Eaton China President Howard Liu jointly launch the Shanghai Soong Ching Ling Foundation ─ Eaton China Community Fund. The Shanghai Soong Ching Ling Foundation ─ Eaton China Community Fund was unveiled today to support China’s social causes and promote the sustainable development of Chinese society. The fund is jointly initiated, operated and monitored by the Shanghai Soong Ching Ling Foundation and power management company Eaton China. The philanthropic programs are expected to cover a wide range of fields, including education, energy, community and the quality of life and the environment. Over the past few decades, the Shanghai Soong Ching Ling Foundation has made big achievements in education, culture, public health, sustainable social development and social welfare. The establishment of the fund also conforms to the government’s sustainable development agenda and strategies.